This tile, although made in one piece for insertion in the place where four tiles had been removed, nevertheless shows a leaf motif being added to the background, meaning its production at a later date. 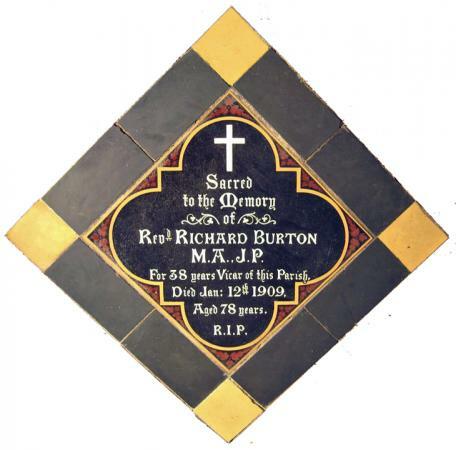 Batchelor Richard Burton came as Curate in 1858, stepped up to the post of Vicar in 1871, and remained a powerful figure of the parish landscape until his death in 1909. He led the two major building programmes of doubling the size of the School in 1871, and rescuing the Church from decay in the £4,000 restoration of 1877. 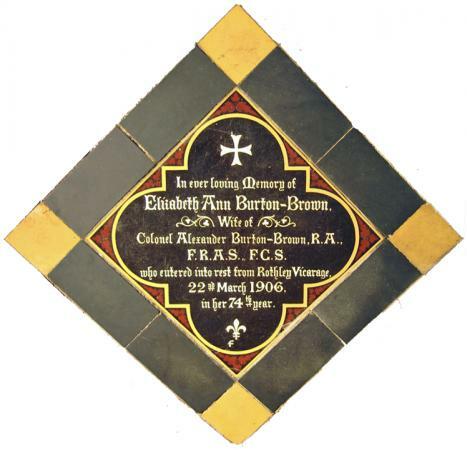 Elizabeth Ann was Richard Burton's sister, who notably was divorced by the Revd Henry Vale in 1872, on falling for the tall erudite Scotsman in uniform, Alexander Brown. Cleaving to him in 1873, she left behind her remaining seven of eleven children, and he added her maiden name to his. Widowed, she may have been living at the Vicarage to care for her increasingly frail father when she died in 1906.